The choir, NHS Blood and Transplant and all those who knew Simonne are devastated to hear of Simonne's recent tragic death. Our thoughts and condolences are with Simonne’s family at this time. She was a valued and respected B Positive choir member and friend who was passionate about the lifesaving power of blood donation following the loss of her son. When she joined the choir, Simonne recorded this film about her son Kavele. As well as being a member of the Choir, Simone worked as a haematology and oncology nurse at Guy’s hospital in central London. She qualified as a nurse in January of this year. Simonne joined the NHSBT choir because of her son Kavele. At 12 weeks pregnant with Kavele, Simonne had a routine screening for sickle cell disease and discovered that she was a carrier of the trait. 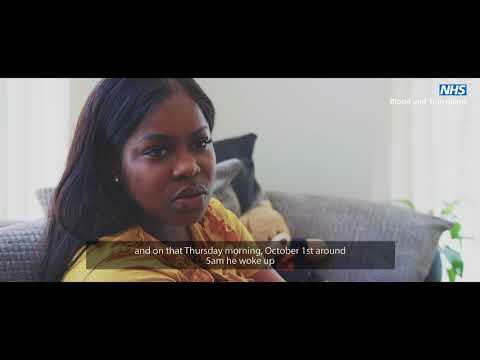 “Knowing both myself and Kavele's dad were carriers of the sickle cell trait meant that my baby would have a one in four chance of developing the condition. “Kavele was diagnosed with sickle cell disease at birth. He had his first sickle at just a few months old. “The sickling happened mainly in his tummy and as he got older, he was hospitalised one or two times a year, usually for a few days at a time. “I gave Kavele medication and monitored him throughout the morning. However, he became more lethargic and I felt his condition was not improving so I called for an ambulance and was told we would have to wait up to 45 minutes. An hour later I telephoned 999 again because Kavele's breathing became more laboured. “Kavele went into cardiac arrest approximately 20 - 30 minutes after several ambulance crews started to arrive. He did not recover and passed away in hospital several hours later." Simonne joined the B Positive choir because she is passionate about raising awareness of blood conditions like sickle cell disease and wants to raise awareness of the need for more young people and more black people to come forward and sign up as blood donors. She explains: “Many people with sickle cell disease rely on regular blood transfusions to live a normal life and often the best matched blood comes from people of the same ethnic heritage, so as sickle cell disease is most prevalent in black people, it’s important that black people give blood. It’s also important for more young people to give blood so that blood stocks for the future can meet demand. Simonne studied to become a nurse, qualifying in January 2018. She joined Guys' and St. Thomas' Hospital, London in February 2018 as a staff nurse in Haematology/Oncology.